Where are we now? – Where's Teddy Now? Happy Canada Day. 151 for us. We’re in Calgary, getting ready for our Petit Voyage 2018 to Europe. Our travel planning post will explain the details, but in short it’s seven full weeks of backpacking through the Netherlands, Germany, Czech Republic, Italia, and Greece. More than a little bit of driving, as well. We leave on Monday July 9. Happy New Year. Our next adventure begins in 907 days. But for the time being… life, work, family and all of those domestic things one must do to support the travel habit. Plan A – Strasbourg, in central Europe for 8-10 months, 2-4 months in the South Pacific, Bali and Fiji. Plan B – Japan for 8-10 months, 2-4 months in the South Pacific, Bali and Fiji. We have returned home, almost exactly one year since leaving on our Le Grand Voyage. We are ambivalent about this fact. On the one hand, we are very happy to reconnect with friends and family, on the other… my head is still in Paris. There’s a song about Paris on the Prairies… sorry YYC, but you’re not it. I’ve visited this UNESCO World Heritage Site twice before, but only in passing. I’d made my cursory visits to Old Faithful, but had never really explored the park. Now, two days isn’t much time to see the park (we’d need a month to crawl all over around the amazing scenery here), but I was able to introduce the girls to a few of the geyser basins (Norris, Mammoth) and catch some pretty exciting eruptions. A short little field trip about 300 km to the SW, through the Loire Valley and the UNESCO World Heritage region that boasts 44 grand chateaux from the 15 and 16th centuries. No time to visit all 44, but we did get to see seven close up: Chambord, Chenonceau, Clos Lucé, Ambroise (from the outside only, sadly), Azay-Le-Rideau, Ussé, and finally, Villandry with its beautiful gardens. The scene above. This was fun… to begin. Previously, in Beaujolais and Bourgogne, we experienced some of the finest road touring ever. I love a new road and great scenery! Today’s trip from Dijon to Paris, via the backroads, was just as wonderful. Sombernon, Vitteraux, Thil la Ville, Avallon, Vermenton, and, of course, Auxerre. Traffic into Paris, though, killed us. But we made it, and are now ensconced in our apartment for the month, in the middle of the 9th Arrondissement. We’ve quickly descended from the mountains and entered the valley of the Saône River. This is (as I just learned today) the heart of the Beaujolais sub-region, which belongs to the area of my favourite varietal, pinot noir. (I am quite decided as regards the Sideways debate.) We’ll stick around here for a few days to tour Lyon and Mâcon, and to taste some great gamay and pinot. May 26–27: Dijon, Two nights in Pinot Noir heaven. We’ve taken to the mountains – too much time away from home, I suppose – to breath in some fresh air and climb mountains. Our goal (achieved) was to to gain 3 800 metres in altitude at the expense of l’Aiguille du Midi. Leaving the azur coast, we have travelled north towards Grenoble through some of the most stunning alpine scenery imaginable. This is the route that Napolean took, the Route Napoléan, that ended with his 100 days. We’re bound for the alpes, and to get a taste of this mountain city. A big road tripping day to get to Nice from Montpellier; along the way, we dropped in on Nîmes, the Pont du Gard, and Avignon before the last two and a half hour drive to Nice. Our address is 13 Avenue Shakespeare. La Fille used to live at No. 8, twenty years ago. May 1–3, 2015 : We are in Montpellier, in the region of Languedoc-Roussillon, France. Provence, baby! This took some work… but we made it to our temporary nest in Montpellier using cars-buses-trains and more cars. Our little base to explore some of the little villages in the region and begin our French wine adventure. We went into Limoux, Pezenas, and Carcassonne. April 29–30, 2015 : We are in Cinque Terre, Liguria, Italia. An epic drive across and through the mountains brings us back to the sea, and to the National Park of the Five Lands. We’re actually sleeping in La Spezia, the trail head to the villages of Monterosso al Mare, Vernazza, Corniglia, Manarola, and Riomaggiore. April 28, 2015 : We are in Greve, Toscana, Italia. We are in the middle the Chianti country, land of Il Gallo Nero. Just a day trip from our base in the Pistoiese Mountains. April 26, 2015 : We are in Firenze, Toscana, Italia. We took a one day trip into Firenze to show La Petite Fille ™ the major sights. We walked almost 15km today. April 23, 2015 : We are in Pisa, Toscana, Italia. The first of our day trips into the surrounding countryside. just over an hour away, this was La Petite Fille’s ™ most anticipated stop. April 21–28, 2015 : We are in San Marcello Pistoiese. Toscana, Italia. We’re back to Toscana after an absence of nine years. La Fille ™ et mois came here first during spring break 2006, exploring the land of Chianti and the regions of Umbria and Toscana. 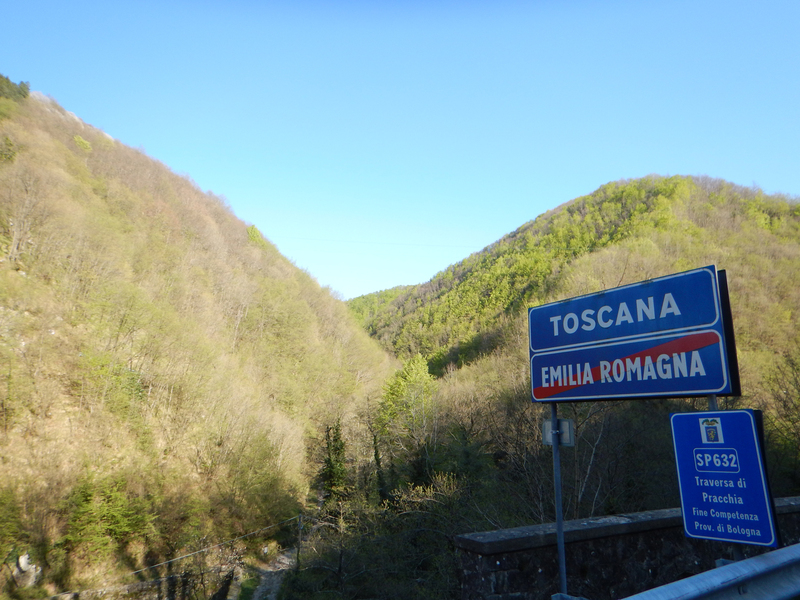 Now we’re back, but this time to the far north of Toscana; if we walk across the street, we’d be in Emilia–Romagna, a different region altogether. This is our base of operations while we explore Firenze, Pisa, and Cinque Terre. Explored Porretta, and the termi – the hot springs. Nothing much to see here. You can also connect with us on Facebook. I’m Ted Boreal, Tina is Tina Sollazzo. Scroll down to see where we’ve been lately. April 17–20, 2015 : We are in Venezia. The Veneto, Italia. We’ve cut the parents/outlaws loose (back to Ontario to you!) and are taking a short, but very expensive sojourn back to Venecia. Both La Fille ™ et moi have been here before, me 9 years ago, she 20. The first time together, and with La Bambina ™. Our Calabria road trip ends, and we’re back in Roma to drop the Outlaws off for their flight back to Ontario. We’ve gotten here around noon, which gives them one last opportunity to shop ’til they drop. We’ll take the regional train to Roma Fiumicino airport tomorrow, then hop on our own high speed connection, the Frecciargento, that beings us into Venecia in three and a half hours. We’re heading into the (to us) unknown Italy. We’ve both been here a time or two before, but never to the south, to the foot of the country. We’ll explore the homeland of the father outlaw, whose grandfather was born in Cosenza. Pietrapaolo will be our base of operations. Back to Europe for the last mega-leg of Le Grand Voyage. We’re allowed 90 days of visa-free travel here (thanks to Mr. Schengen), so we’ll spend a month in Italia, and two in France. Arrived from Thira by Bluestar Ferry. 40E one way for all three of us. Eight days on Thira (Santorini); four days near Perissa and wine country, and another four days in Finikia, which is near Oia. Two very different places and very different vibes. Three nights in the westernmost of the Kyklades; a wonderful volcanic island. Car rental brings us to many beaches and small villages (like Tripiti and Plaka), and a full day sailing trip brings us to more beaches and seaside views. 3.5 hours by fast ferry from Piraeas. Packing day for our three (or five) week trip through the Kyklades (Cyclades) Islands. A car rental takes us to the Temple of Aphaia, Agia Nektarios, Perdiko, and Palaiochora. A ferry to the nearby island of Agistri, where we spend the night in Megalochori. Beautiful, quiet, and very peaceful. The Temple of Poseidon at Cape Sounion. Up the cog railways to visit small towns up in the mountains. Visit to the ruins of Olympia, and then hotel on Karouta Beach, which we have all to ourselves. The second stop in our five (or six) day roadtrip through the Pelloponesian Peninsula, south of Athens. Highlights here are the Methoni Castle, Voidokilia beach, and the town of Pilos, which is 15 minutes away. Our first night. The Palamidi Castle ruins were amazing. An amazing feat of engineering, joining two seas. Monday September 8 is considered our Day 1 on our Le Grande Voyage. We have arrived. A short little get-away, sans La Petite Fille ™. Three days of wine, wine, and a little bit of history. We hit maybe a dozen wineries (faves were Smalltalk and Ravine, and Trius). We were also able to take a look at the Laura Secord homestead, Fort George, and the Brock Monument atop Queenston Heights. As of Friday August 8, we’ve been in beautiful(ly humid) southern Ontario, at the Sollazzo family homestead. This is our base of operations for a few weeks as we chill, make last minute plans,and wander about wine country (which is only about an hour away).